When exercising, we can put our joints through a lot of stress – particularly our hips and knees. Whether it’s through bad form, over exertion, or faulty mechanics, there are many reasons why our joints can start to feel weak and painful. 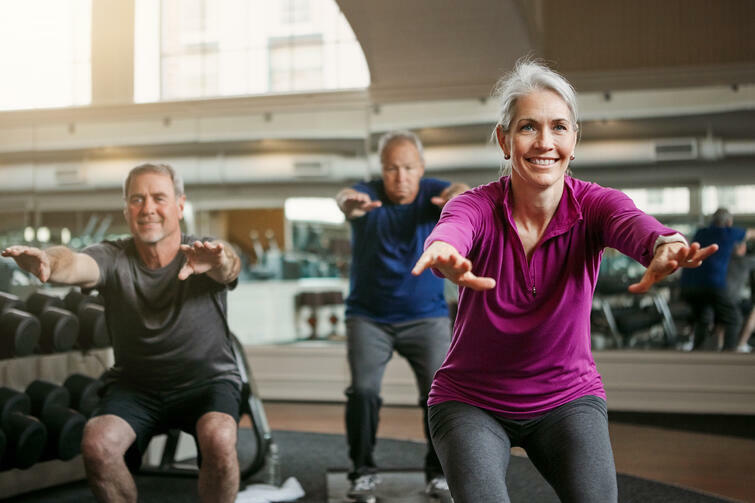 That’s why we’ve pulled together a set of functional exercises (one’s related to our everyday lives) that can be performed every day to strengthen and protect the hip and knee joints by building up the muscles around them. This lower body exercise strengthens the hips, glutes, hamstrings, quads (front and back leg muscles) and, indirectly, the abs (stomach muscles). It’s a classic that everyone knows, but one that’s easy to get wrong! Start by placing your feet a little wider than shoulder width apart, with your toes turned slightly outward (we’re not talking of a ballerina’s plie here, just a very slight rotation!) This will stop your knees from turning inwards as you do the squat, meaning that you’re able to engage all the correct muscles. As you descend into the squat position, think about pushing your hips backwards as if you were sitting down (rather than bending your knees) until your hips are parallel with the floor. This will ensure your knees stay back behind your toes, which will properly activate your glutes. Remember also to look forward and keep your chest up to avoid putting unnecessary pressure on your back; it should be a natural movement. If it helps, you can put your arms out in front of you for balance. Start by doing 10 repetitions (reps) in one to three sets, building this up as you get stronger. For more information on reps and sets, read our ‘Gym Jargon Buster’ blog, here. Standing on a step or box, lower one foot down towards the floor (without actually touching it) in a slow and controlled manor, then lift it back up. You want to make sure that you’re tight in the glutes, so that the knee lowering you down is not wiggling about! Your movement needs to be steady for it to have the desired effect. After you’ve performed this exercise on one leg, swap over to the other one. Try to do 10 to 15 reps on each side, or until you reach the point of fatigue, which is where the muscle is burning but you’re not feeling pain. This exercise targets the outer hips. First, place a resistance band around your ankles (all gyms should have these, or you can buy them from most sport shops). Then, with slightly bent knees, take one step to the left, followed by one step to the right, and keep on repeating this. You want to make sure that your shoulders aren’t swaying much and that you’re isolating this movement to the hips, so keep on doing nice and steady steps. The band will want to pull your knees in, but you must be active and push your knees out, so that you’re strong through the hips and working your muscles in the best way possible. Try doing a total of 30 steps, or until you feel fatigue on the outsides of your hips. Lying on your back with your knees bent and arms down by your sides, lift up your hips until your back and hips are in a straight position and then lower back down. When you descend your hips, try not to let them touch the ground, stopping just before this happens, then lifting them back up. This way, you’ll keep all your leg muscles activated as well as your abs. Start by performing a small number of reps, e.g. 10 to 15, or until you feel a good burn through your glutes. Similar to the hip lift, lie down with your back on the floor and stomach muscles tightened. Keep one of your legs straight and bend the other. Next, slowly and smoothly lift your straightened leg about 30cm off the floor, which will tighten your quads. Hold this position for three to five seconds, then gently lower your leg. Repeat this sequence 10 times, then switch to the other side. Depending on your strength level, you may wish to up the number of reps on each side or add more sets. Lie down on your side with your legs extended out straight. Your lower arm can be positioned comfortably under your head, while your hand from your top arm can be rested on your upper hip. Next, raise your top leg up, keeping your body steady so that your pelvis doesn’t roll forward or backward. Then, lower your leg back down and repeat. Perform up to 30 reps on each side, or until you start to feel the burn! For an added challenge (or if you’re feel super human today), you could wear an ankle weight. An extremely simple exercise, this one can be performed at work, at home and even while you’re out and about! Stand on one leg, using a chair or wall to help you balance (if you need it). Slowly, lift your foot onto your toes, then lower back down. Once you’ve mastered 30 reps on each leg with correct form, and without using an object for balance, try increasing the difficulty level by holding dumbbells as you perform this exercise. Tip: For balance, it helps to keep your bent leg tucked behind your standing leg. We’ve left this one till last, as it’s possibly the trickiest to perform! Laying on one side, squeeze in your abs and lift up your hips to create a straight line, so that only your forearm and outer foot are touching the floor (there will a triangular gap underneath your body). Maintain this position for 30 seconds, then relax. Repeat for five reps on each side. For the ultimate burn and test of strength, try lifting your top leg while holding the plank position! Your hips and knees are some of the most important joints in your body – you couldn’t jump, squat or even bend your legs without them, so the time to start strengthening them is now. 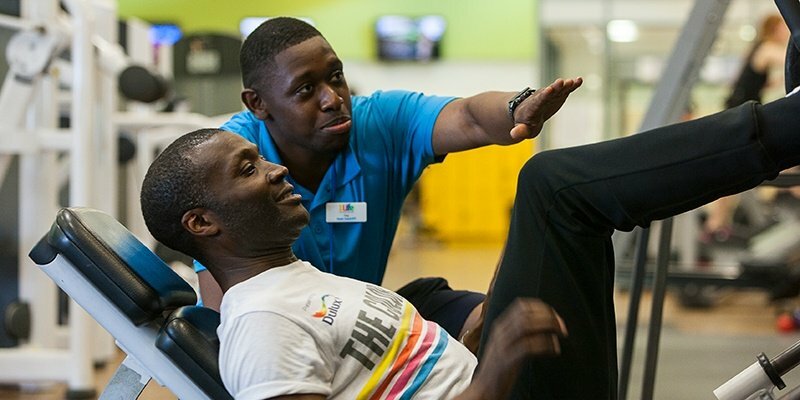 If you’d like support with this, please do visit your 1Life centre, where we’d happily talk you through the options to help you reach your goals, from personal training to group exercise classes. Find your 1Life centre here.